LynchyRightNow: Are we there yet? The bus to March Madness is in the parking lot and the final game of the college basketball 2007-2008 regular season is upon us. I haven't focused to much on college hoops because the regular season is about as important and pointless as sunglasses at night. In March however, the college basketball world invades my life rendering me utterly useless in any other facet of that life. PREVIEW: The is the first year in recent years that I can completely and honestly pick who I think will win, foregoing my usual putting BC into the sweet sixteen because they aren't getting an invite to the dance. You know who received votes in the top 25 last week? Virginia Commonwealth, Robert Morris, Stephen F. Austin, and St. Mary's. How shocked are you really going to be at first & second round upsets? Remember, several years ago a fellow by the name of George Mason reached the final four. WARNING: extreme Duke & UNC hatred about to take place . . .
Good enough for you yet? Except it probably isn't because along with the hoards of fans who bleed Carolina blue, the media is just as blind. Who has UNC beat? GIVE ME A BREAK! UNC will probably be awarded with a #1 seed and two more soft victories to bring them right into the sweet sixteen. SHOCKING! Duke waxed them back in February and I hope they slice them up again this weekend. If it weren't for the zebras BC would have upset them on Saturday afternoon and Roy would have been crying all the way back to Tobacco Road. OH! Coach K, don't think your getting off that easy but I can cut you a little more slack, wins at tourney bound Cornell & beating Maryland twice handily allows me to do so. You did dismantle Clemson in regulation and played a team, Alabama, from the SEC so maybe, you attempted to get quality wins. My issue with Duke is, you live by the three, you die by the three. The back-2-back losses at Wake Forest followed by Miami would scare of any crazies from picking them to survive the eyes of March. 8-28 from the arc against Wake Forest proves the point, you live by the three, you die by the three, 15-37 against Miami just days later would further do that. When your Coach is the tallest guy on the floor you may be in for tournament trouble. You know the problem in mirroring the Phoenix Suns? THEY NEVER WON ANYTHING. North Carolina; see this weeks addition of SI, Tyler Hansbrough NCAA college player of the year. As much as I hate it, there is no doubt UNC gets a #1 seed provided they beat Duke in the regular season finale and go deep into the ACC tournament. Despite every media outlet in the country drooling over Hansbrough, Danny Green, Wayne Ellington, and Ty Lawson are the grease on UNC's wheels. The guard trio is averaging a combined 41 ppg and 10 assists a game, and that is without getting the 10,000 phantom calls that Hansbrough gets each game. AGAIN, guard play puts you in the final four. Playing in a conference which could deliver the most tournament teams, the PAC-10, UCLA will get a #1 seed, deserved. UCLA will be a top seed and will visit the final four for the 3rd time in 4 years. They play on the west coast, so for my EAST COAST BIAS READERS, they are GOOD. If not for the beast, Michael Beasley (K-State, 27 ppg & 12 boards a game) UCLA's Kevin Love would be a contender for player of the year averaging 17 points and 11 boards a game for the 3rd ranked Bruins. 14-2 In conference play, UCLA has tough ball games left against Standford #7 in the AP & Cal to close out the season. Josh Shipp & Darren Collison (notice a theme) lead a tremendous backcourt into tournament play, their 3rd campaign at the final four begins NOW, and this time they'll be NO GATORS. Finally, Kansas. Despite February losses to Texas & Oklahoma State the Jayhawks have rebounded quite nicely, avenging their first loss to K-State with a 14 point win and dismantling Pat Knight and the Red Raiders by 58 points, ouch, imagine the hemorrhage that the General would have had. Bill Self's squad is B-I-G with Darrell Arthur at 6'9 and Darnell Jackson at 6'8 leading the way the Kansas front court IS the best in the nation. If Kansas can beat Texas in the Big-12 tourney and prove they are the best team in the conference then they are a lock for the fourth #1 seed. Non-conference wins include on the road at Georgia Tech and USC, look for junior guard Brandon Rush to have a great tournament run. Which conference is poised to take over the field of 65? You have to love the chances of the Big East, right? I agree. The Big East will send maybe half of its conference to March Madness and that doesn't include Syracuse, who blew their chances with losses at Ohio State early and at home against the Minutemen from Amherst. The Big East currently represents 20% of the AP top 25, from Georgetown as high as #10 and Marquette at the back end #20. Pitino and Louisville, #13, took out Kentucky early and will play a great season finale at Georgetown this Saturday. The beasts of the east however I believe rest in #19 Notre Dame and #14 Connecticut, further back in the pack with identical records, UCONN and ND have played great down the stretch run. Notre Dame is 9-2 in their last 11 games and UCONN has lost only once since January 18Th. I will say this though, I fully expect either Louisville or Georgetown to suffer an upset loss within the first two rounds, especially if Pitino is wearing his Colonel Sanders gear. The Reverse . . Which power conference will be a disappointment? The question wasn't even on the keyboard when I already spit-out B-B-B-Big Ten. Wisconsin, Purdue, Michigan State, and Indiana are the ones we'll talk about. Let me start off with the Hoosiers, hate the school, love Eric Gordon. Had a great coach, team was behind him, and now that is gone, the 25 wins are great but the 5 losses are even greater, three conference losses to better teams, MSU & Wisconsin (2), then you got losses early to UCONN & Xavier, text me when they get bounced. 4-4 since February 1st doesn't exactly impress me Tom Izzo and Michigan State and don't think I forgot about that January game with Iowa, 18 points in each half, ehhhh sorry. The heavy hitters of the Big Ten are Purdue and Wisconsin. Does that mean I can forget about the early losses to the Dukie's and Marquette by Wisconsin, or how about the losses from Purdue at Clemson and Missouri? The top two teams in the conference have good records and have played well lately, but against each other. Their out of conference schedules are riddled rival conference victories, doesn't look so good for the Soft Ten. So who is the consensus player of the year? He doesn't wear Carolina blue so just stop it. Kansas State power forward Michael Beasley is hands down the best player in the country. As I noted earlier his 27 points a game and 13 rebounds is dumbfounding playing in the Big 12 with opponents like Kansas, Texas, Texas A&M, Oklahoma, and Baylor, all who have twenty + wins. The 6'9, 240lb Beasley is an absolute monster of a basketball player, 4 of his first 5 college basketball contests he scored 30 or more points, A FRESHMAN. In the past two weeks here are the point totals from Beasley, 44,30,39 and 33, someone is clearly getting ready for his first and possibly last NCAA tournament. Since the NCAA is largely biased they won't choose a freshman as player of the year for a second straight year expect Michael Beasley to get jobbed, bad. Which team is the largest sleeper in the tournament? I don't consider that #13 seed who is cute and wins one or two games to be the "team to watch for" so sorry fans of Harry Potter University. The team you NEED to watch for isn't from the Pac-10, Soft-10, ACC, SEC, Big 12, or Big East, oh no they are from none other than the Atlantic 10. 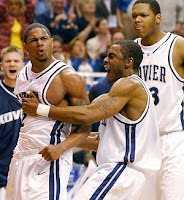 Enter the Musketeers of Xavier, don't be shocked they are ranked as high as #8 in the Associated Press rankings. Before Xavier entered their giant chunk of conference play then went on a five game stretch in which they played, Tennessee, Auburn, Virginia, Kansas State and Delaware State, errrr leave off the last one, Xavier came out with 3 wins and 1 loss, not bad for a team from the A-10. One of the most underated things in the tourney is experience, something Xavier has plenty of, starting three seniors, guards Drew Lavender & Stanley Burrell along with senior forward, Josh Duncan. If you don't remember let me help you, this is the same team that SHOULD have knocked off #1 seed Ohio State last year in the tournament but were the victims of Mike Connelly and his miracle three with 2.5 remaining in regulation. Widely considered one of the best games of the tournament and these kids have a good memory. Lavender's best game was his 21 point effort against K-State, the same game that his team held Mike Beasley to just 5 points. Watch for the kids from Xavier, they are going to turn some heads in the tournament. 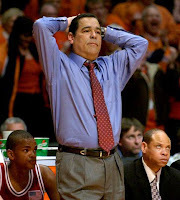 Just got a text message from Kelvin Sampson, gotta run . . .